I was told to have oil changes every 5,000 kilometres, is this correct? Typically you should have your engine oil changed every 5,000 kilometres. However, this could vary depending on the vehicle. It’s best to check the owner’s manual for this information. It’s important to know that engine oil doesn’t last forever. 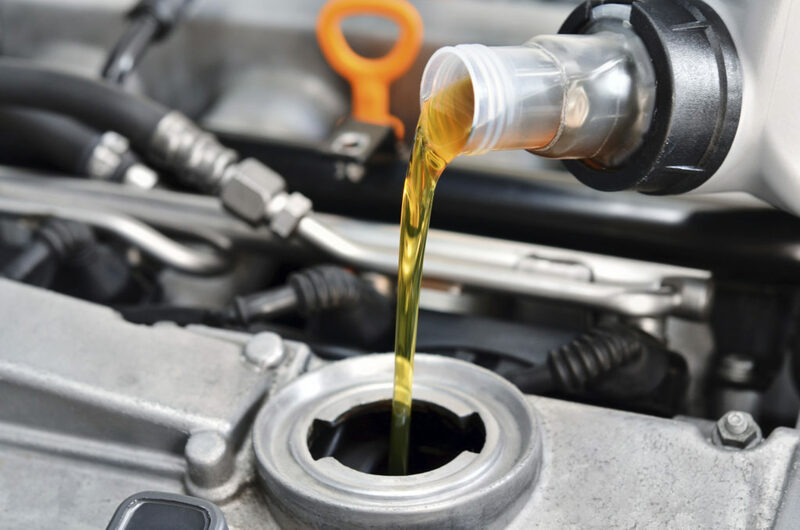 If you’re doing a lot of driving, it’s best to get your engine oil changed often or if you are planning a long distance drive, before your trip. Engine oil lubricates and helps cool the moving parts of the engine, without it, an engine would not run for very long before heat caused by friction would cause it to seize up. This is why regular checks of the engine oil level and following the manufacturer’s recommended oil change interval is so important. Are there any other car fluids that should be checked? Transmission Fluid lubricates the moving parts in the transmission. It also prevents corrosion and wears on these parts. Some say transmission fluid doesn’t need to be changed until the vehicle has reached 100,000 kilometres. We recommend the transmission fluid is inspected at least every 50,000 kilometres. We suggest this because it’s important to take preventative measures to prevent transmission damage, which can be very costly to repair. Engine Coolant protects the engine, its cooling system and the vehicle’s cabin heating system from damage from overheating or freezing. During a preventative maintenance inspection, we check for proper fluid level, freeze/boiling point and level of acidity. Over time coolant deteriorates and can cause damage to all parts it comes in contact with. This fluid change typically happens every 30,000 kilometres. Power Steering Fluid provides hydraulic pressure and lubricates the components of the power steering system. Steering will become very stiff and make it difficult to steer properly if there isn’t enough fluid. This fluid should be changed every 5 years or 75,000 kilometres. It is important to flush out and completely replace the old fluid to ensure that the steering system is clean and performing at its best. Brake Fluid absorbs the moisture from the atmosphere and can lead to reduced braking performance and damaged brake system components due to rust. Water mixed with brake fluid will cause it to boil at a lower temperature. If this happens, you’ll notice your brakes won’t work as well which is clearly not safe. With a regular maintenance inspection by your local Master Mechanic, the boiling point of the brake fluid will be checked, and any recommended services will be provided. This fluid change should be done every 2 years. Not sure when to have your oil changed? Contact your local Master Mechanic to learn more about fluid and lube maintenance.